The Criswell & Criswell Plastic Surgery Center located in the Ballantyne area opens September 24, 2012 and Dr. Kara Criswell and Dr. Bryan Criswell are excited to provide patients in the Charlotte area this optimal pre-operation and post-operation care. The Criswell & Criswell Plastic Surgery Center is a fully accredited, state-of-the-art center that will provide every patient the most convenient, confidential, and most personalized setting possible for any procedure. A in-office Plastic Surgery Center provides the ultimate care and safety for every patient by giving the surgeons and nurses the ability to control their environment and treat patients with the best care possible. In addition, surgery scheduling is more flexible and more cost-effective at in-office surgery centers than in a traditional hospital. Criswell & Criswell believes that privacy and comfort are two things that patients should not have to sacrifice. While patients recover from plastic surgery procedures, rest is very important. Criswell & Criswell Plastic Surgery aims to provide the most relaxing and comfortable environment for every patient to help promote fast recovery and optimal plastic surgery results. The Criswell & Criswell Plastic Surgery Center is specialized to provide the optimal patient experience, before and after each procedure. Plastic surgery encompasses a broad spectrum of treatment options and the skilled and board certified surgeons and staff of Criswell & Criswell Plastic Surgery specialize in offering quality and individualized care to every patient. Dr. Bryan Criswell and Dr. Kara Criswell want every patient to expect the exceptional. 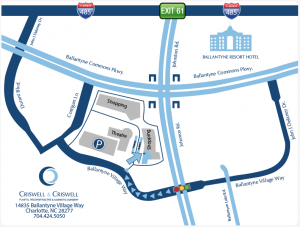 The Criswell & Criswell Plastic Surgery Center is located in the Ballantyne area of Charlotte, NC at 14835 Ballantyne Village Way. Visit www.criswellandcriswell.com for more details about the Criswell & Criswell Plastic Surgery Center.